Navvia is an advanced BPM and ITSM system that helps companies tailor industry-specific and personalized processes, and cut implementation costs. This cloud-hosted system helps design, audit, and research any type of business process, but also offers ITIL V2, V3, and CobiT-friendly templates for users to create their process from scratch. You can also use Navvia to automate the creation of your documents, and export them in the desired format. The large number of unique features makes Navvia one of the most popular service management and consultation portals, so that businesses can improve the services they provide to their customers. At the same time, Navvia will analyze the quality of your existing processes and depict opportunities for development, and verify their structures comparing them to standard control protocols such as ISO2000, Sarbanes Oxley, CobiT®, or your personal ones. Navvia’s tech support team will be on your disposal at any moment, and help you implement the system easily regardless of your technical knowledge. You can also use their free implementation training, and participate in on site workshops. 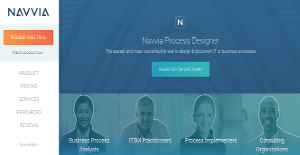 How exactly will Navvia help you to revolutionize your processes? In short, this system offers the functionality needed to make process design more effective, and to streamline the service provided to end customers. The friendly and familiar drag-and-drop interface and premade templates help you design beautiful processes, while the advanced Data Model captures all elements that are involved in those processes. To make matters even better, Navvia allows you to adjust capture requirements so that processes will be automatically edited, and all future changes will be reflected in them. Once created, all processes are divided and organized in categories and work spaces, and the admin assigns user access permissions to control who can see and edit them. For loyal clients, the company can design private work spaces and adjust permissions separately. Navvia also makes it easy to produce and share process artifacts, including automated process guides, RACI charts, flow diagrams, and mind maps. Depending on your industry, you can also generate complex technical documents, and report on you activity at any point of time. It is exactly the analytical capacity of this system that helps customers evaluate the health of their processes, implement process governance controls, and educate and train their users. What is even better is that Navvia is hosted in cloud, and supported on a variety of browsers and operating systems. All Navvia documents are exportable as Microsoft Office and Adobe files, with a disaster recovery plan and a dedicated data backup center. Support is available at any point of time, via email, phone, or on site tickets. There are well-liked and widely used solutions in each software category. But are they necessarily the best fit for your company’s unique requirements? A popular software product may have thousands of users, but does it present what you require? For this reason, do not blindly shell out for popular systems. Read at least a few Navvia reviews and think about the factors that you desire in the software such as the cost, main tools, available integrations etc. Then, select a few apps that fit your wants. Try out the free trials of these products, read online reviews, get clarifications from the vendor, and do your investigation thoroughly. This in-depth homework is certain to help you find the most excellent software solution for your company’s unique wants. How Much Does Navvia Cost? A free 15-days trial with limited features is also available for interested users. We realize that when you make a decision to buy Business Process Management Software it’s important not only to see how experts evaluate it in their reviews, but also to find out if the real people and companies that buy it are actually satisfied with the product. That’s why we’ve created our behavior-based Customer Satisfaction Algorithm™ that gathers customer reviews, comments and Navvia reviews across a wide range of social media sites. The data is then presented in an easy to digest form showing how many people had positive and negative experience with Navvia. With that information at hand you should be equipped to make an informed buying decision that you won’t regret. Navvia for helping drive enhancements and proper documentation. A true foundation that documents our IT process. Making use of this service for today and tomorrow. Our process design structure and success was radically changed. An awesome tool! A product that's innovative and different on its own. What are Navvia pricing details? What integrations are available for Navvia? Pros: Navvia does its best to make sure documentation in processes/requirements/specs remain comprehensive. It also tries to keep them together logically while remaining effective. The tool doesn't entail us to be full-time experts in process documentation. At the same time, it ensures we're able to get things right. It has plenty of examples through templates and organized in such a manner to prevent missing out on essential elements. Cons: Very little to hate. It'd be nice if their interface functioned a bit a bit quicker. Pros: It's essentially a one-stop shop for processes. That also includes procedures and policy aspects. It keeps them all organized for you. So you won't need to. What's not to like about that? Cons: The tool isn't as inuitive as initially expected. But once you have an idea on what should be done next, it's a good thing. Expect a learning curve. If you're the kind who doesn't use it all the time, then you're back to learning things all over again. A success story that involves the implementation of ServiceNow. I've recommended and constantly been using Navvia whenever there's a chance for it. If you need more information about Navvia or you simply have a question let us know what you need and we’ll forward your request directly to the vendor.